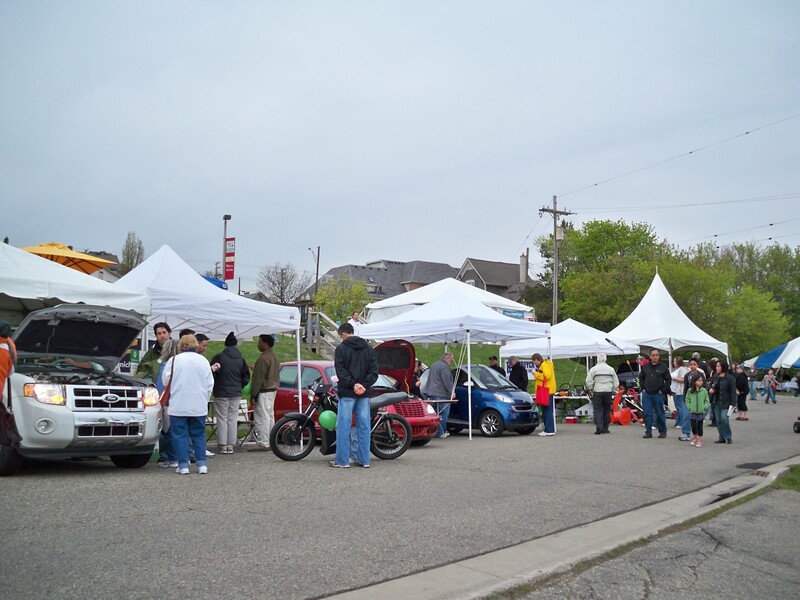 After carefully watching the weather I decided last minute Saturday morning to head to Rochester Michigan to meet the other MEAA (Michigan electric auto association) members attending the event. Being a overcast day with some occasional rain showers the show festival was well attended. 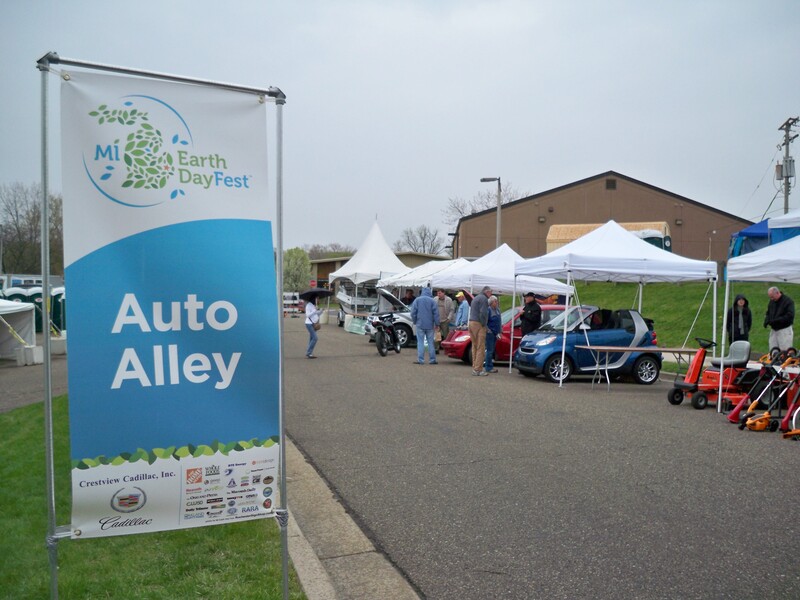 The “Auto Alley” vehicle section ranged from, production hybrid Cadillac’s, Smart cars, fully electric lawn equipment, Fords Plug in Hybrids, and Bio Diesel boats and cars. Ford had an impressive booth showing there plug in hybrid Escape and Fusion. There innovation is first class and their displays really helped show exactly how the entire system works. They had the twin motor/generator’s and planetary gear system on display so you could get a feel of how much technology is being implemented on there new hybrids. 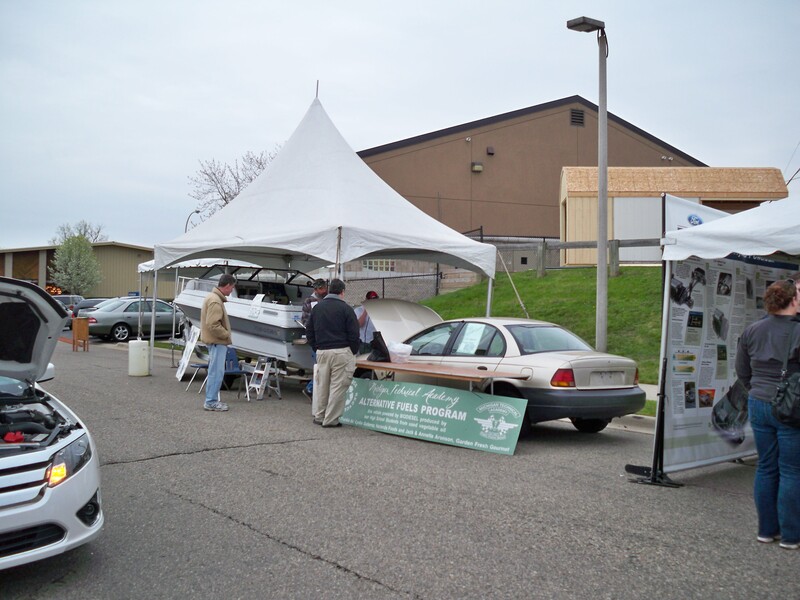 The instructors and one student from the Wayne County Community College were there showing off there 100% Bio diesel 5 cylinder Mercedes speed boat, and their nearly completed Saturn 3 cylinder Bio diesel vehicle. 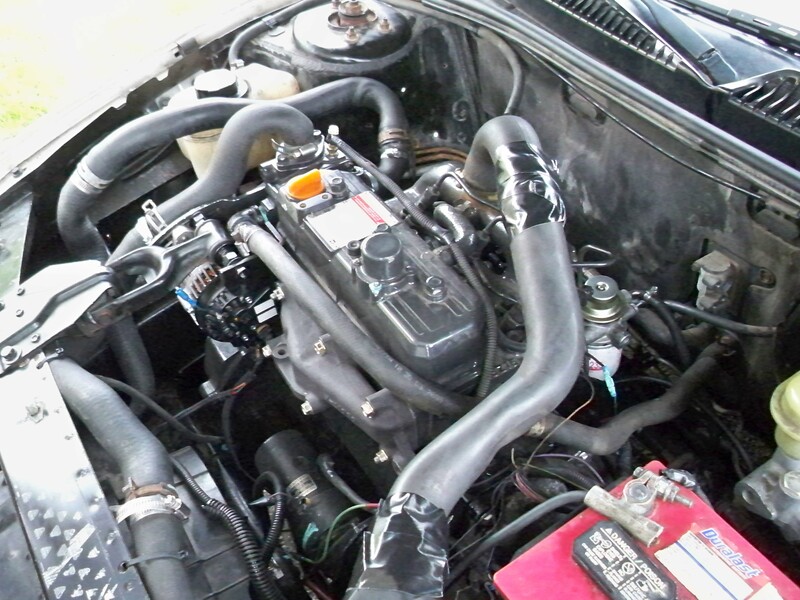 The instructors expect the converted Saturn to achieve about 50-60+ miles per gallon. The instructors were very knowledgeable about Bio diesel and cleared up a few misconceptions about using 100% refined Bio diesel. 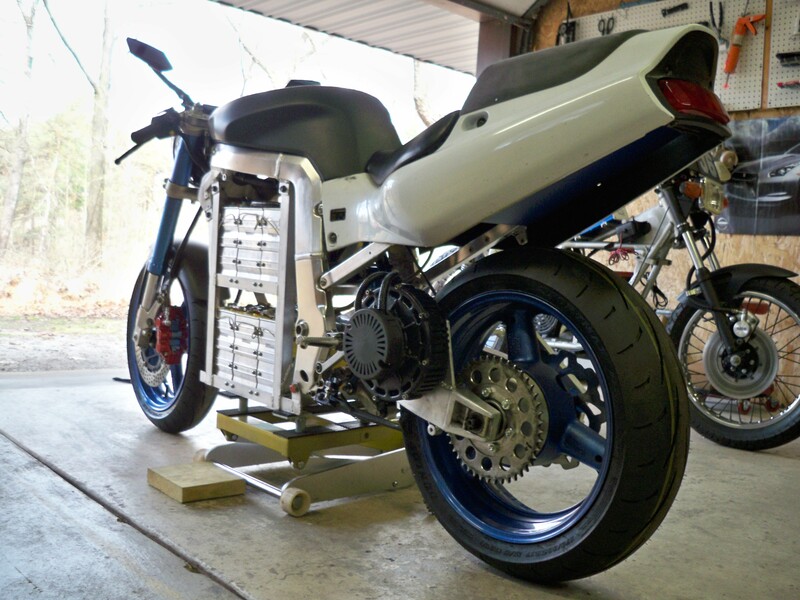 They told me that the students want to convert a motorcycle to a small 2 cylinder diesel engine, Im excited to see students getting involved with new technology in alternative fuels. 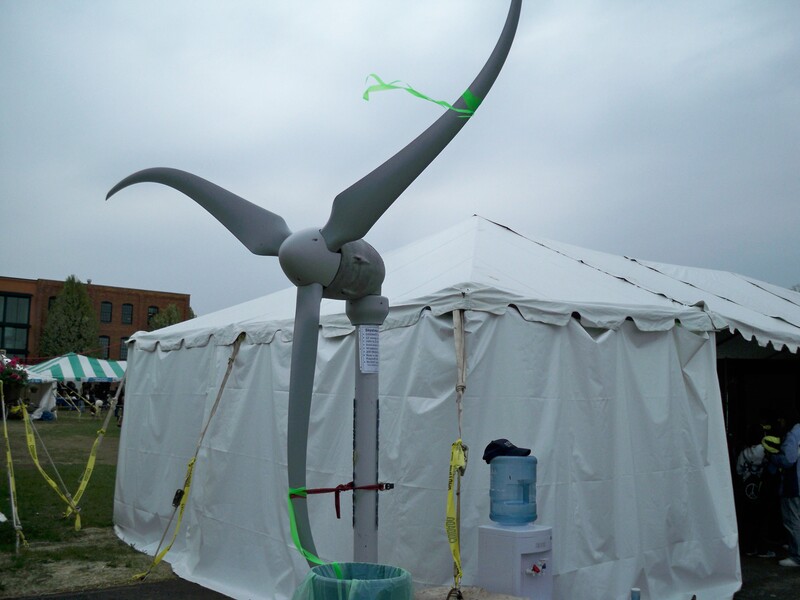 The festival had many booths ranging from organic foods, clothing, lighting, solar energy, and wind energy. 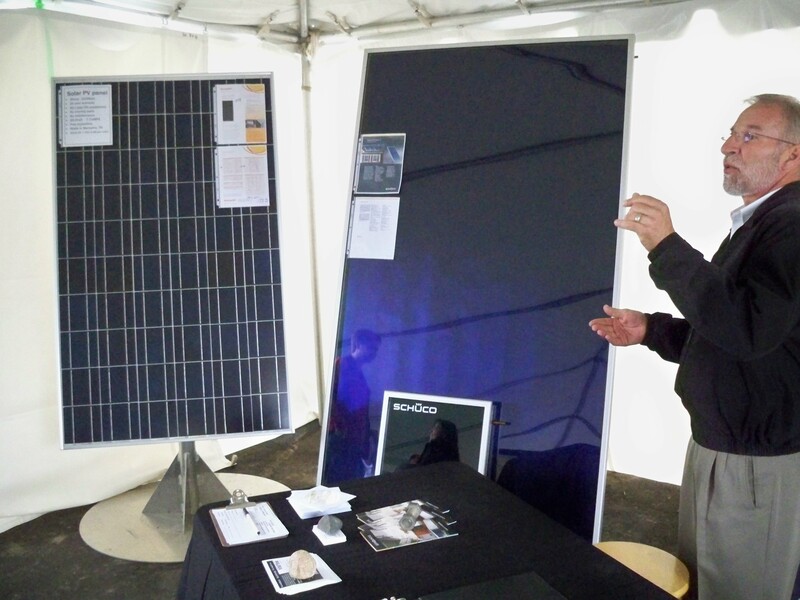 Everyone was an avid believer of getting off the grid and producing their own power. Many vendors were even selling their products right there. My brother even met some of the vendors that his company recommends after he performs an energy audit on a home or building. I would love to see how busy this event would be if the weather was nicer, you can expect me to be back next year. Hopefully with both motorcycles and all weekend. 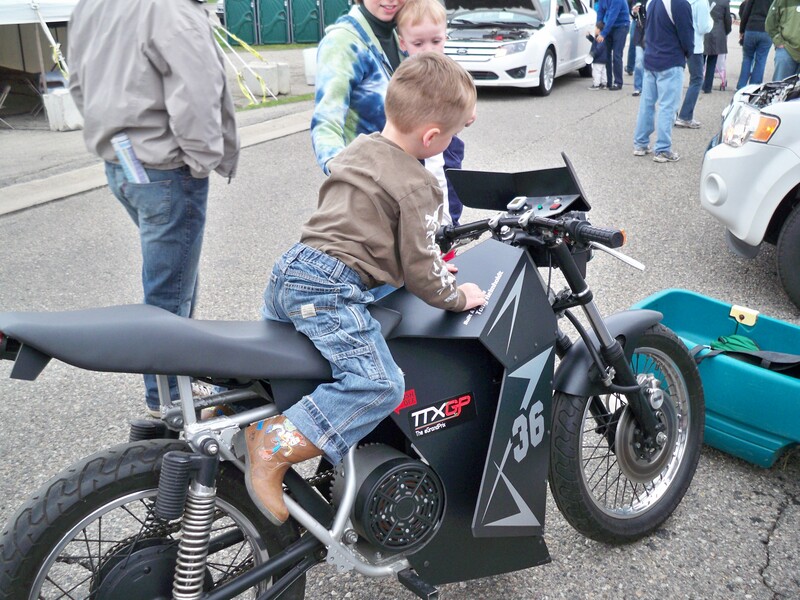 EV addiction starts at an early age! After completing a conversion such as this, you will look back and want to improve and or change a few things. Either because you want too, or because it does not work and you need too. I have listed the modifications and upgrades made to the Zion motorcycle so far. 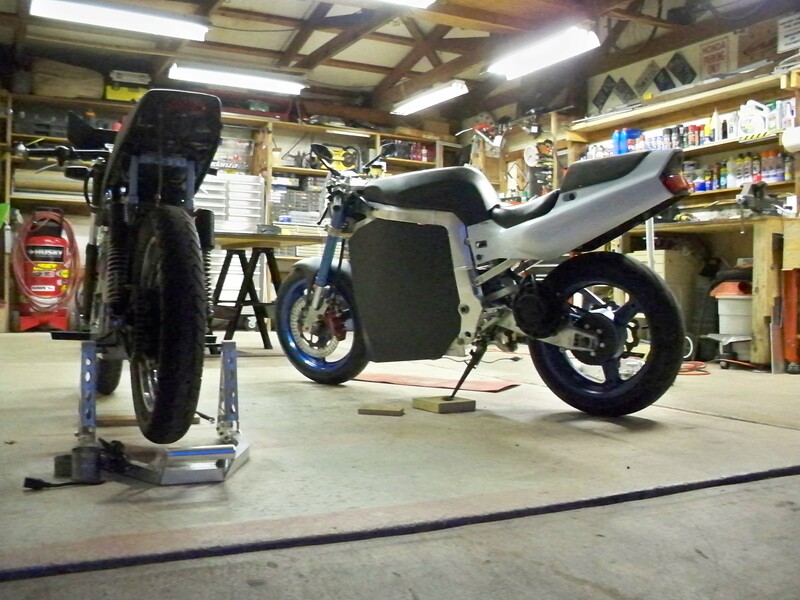 I was in a hurry during the last few weeks of building the bike in order to get it working for the TTXGP mid-ohio race that I didnt fully test and refine the motorcycle. After removing the faring in Ohio I realized what a mess the chain made all over my batteries, frame, wiring… So I made a sturdy, simple, and light weight chain grease shield that prevents it from contaminating other components. It is made from Sintra PCV board and attached with small screws and a bracket. 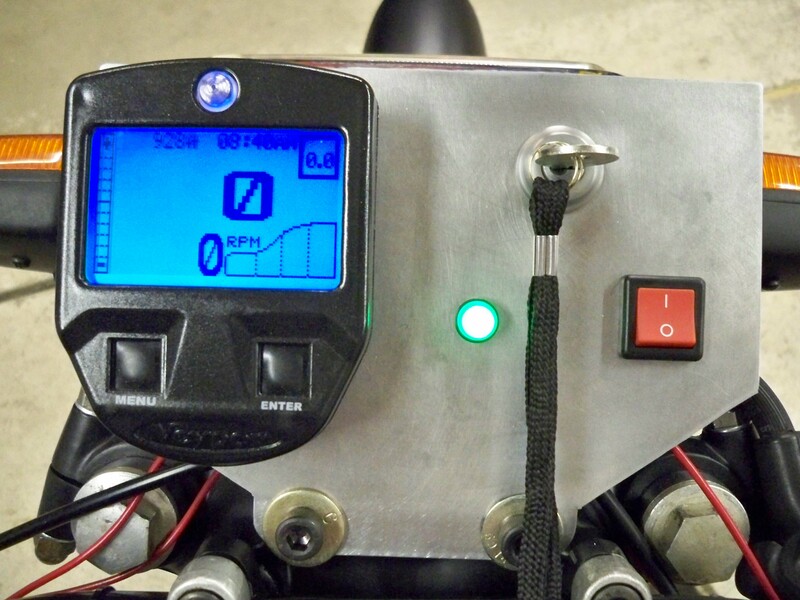 I had read all the features of the Veypor multi-function motorcycle gauge, it sounded very impressive. The key features included, digital and analog speedometer, odometer w/ trip, 1/4 mile timing, 0-60 timing, efficiency, the list goes on… I purchased the unit and initially I was impressed with what I had, everything seemed to work, the speed was calculated off the front wheel via a magnet sensor and the power wires were a simple installation. Soon later I found the speed reading was erratic at times, the menu’s were hard to navigate and difficult to understand. The two main buttons on the unit had little to no “feel” to them, you weren’t sure if you pressed the button or not, epically if you were wearing motorcycle gloves. I was fairly disappointed with the performance of the Veypor unit, the few things I liked was the bright back lighting and large screen. I then did some research and found people using these small “Sigma” bicycle speedometers that had accurate readouts and could calculate speeds past 100mph. 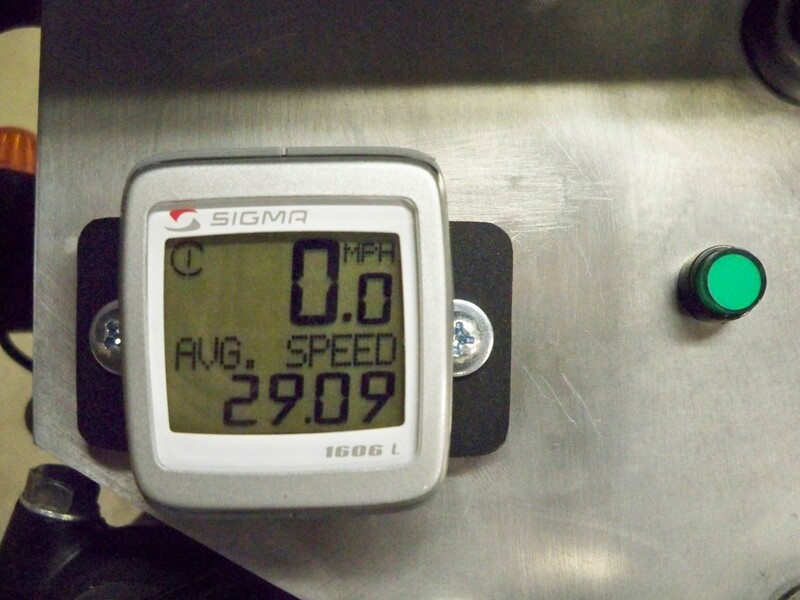 The Sigma has all of the features of the Veypor other then the 1/4 mile, and 0-60 timing, and constant back-lighting. 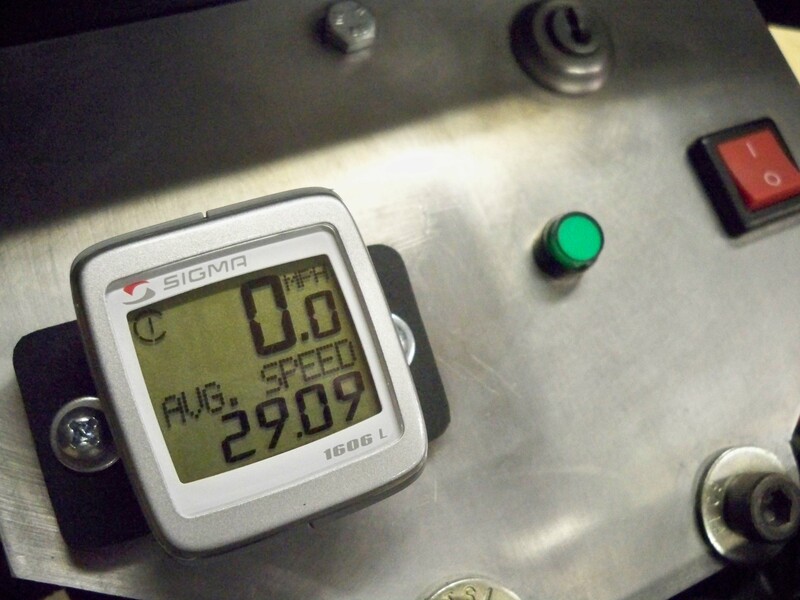 The Sigma is a simple to use and simple to read gauge that is easy to install and has a smooth and accurate digital speedometer. And for a fraction of the cost of a Veypor unit it can do almost all of the same functions at only about $30, as opposed to the Veypor ringing in at $175. My conclusion, Purchase the Sigma (or cycle analyst, ill dive into that later) it is smaller, easier to install/use. and more accurate. The only major down fall is the lack of back-lighting due to it being powered off a small button battery, This can be solved with a small LED pointed at the unit for night riding. 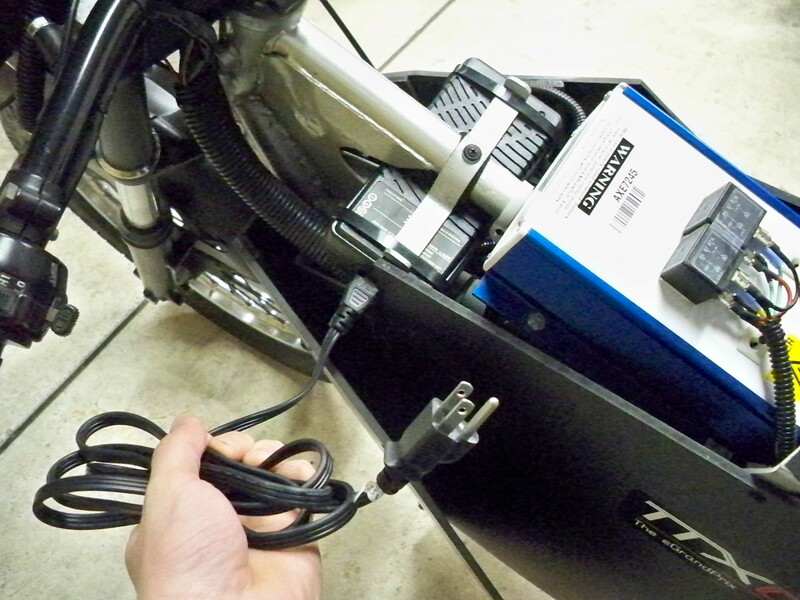 If you read my earlier post I had some charging issues with the Zion’s 60 volt 20amp charger (china made) When the motorcycle was in its early stages it only had one goal, GO FAST. 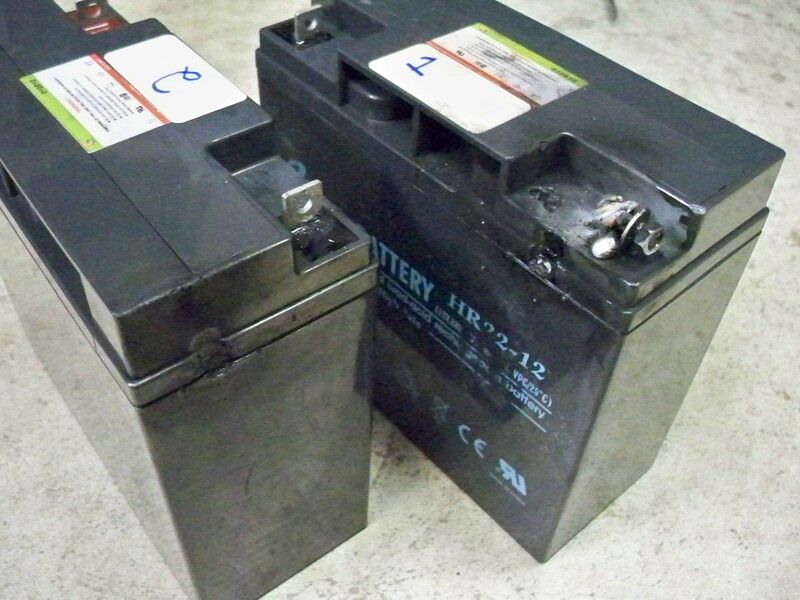 So I installed 60 volts of high current odyssey batteries powering a Mars “R” motor which is only rated at 48 volts max, I figured Since I was looking at going fast lets push a little more voltage at it, well that motor only lasted about 3 miles until it burned up a couple brushes. 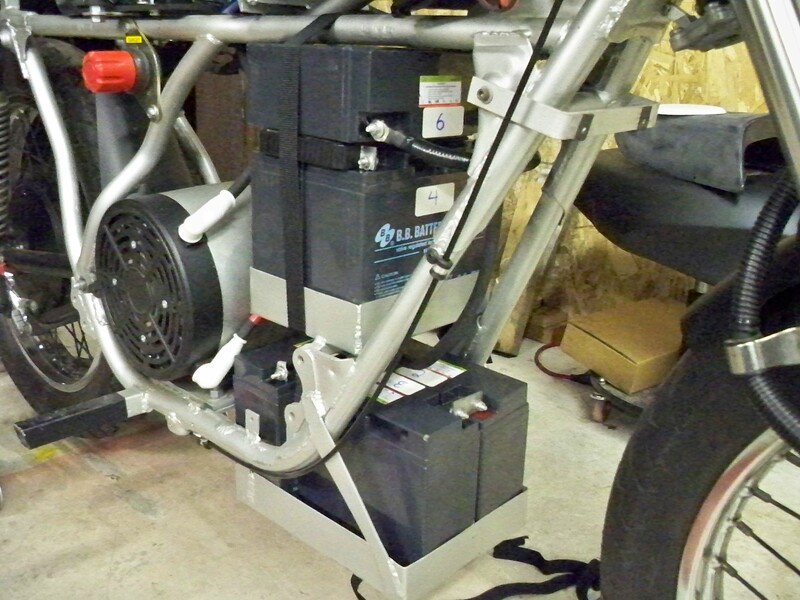 I then purchased and installed a Mars “RT” motor rated to handle 72 volts. 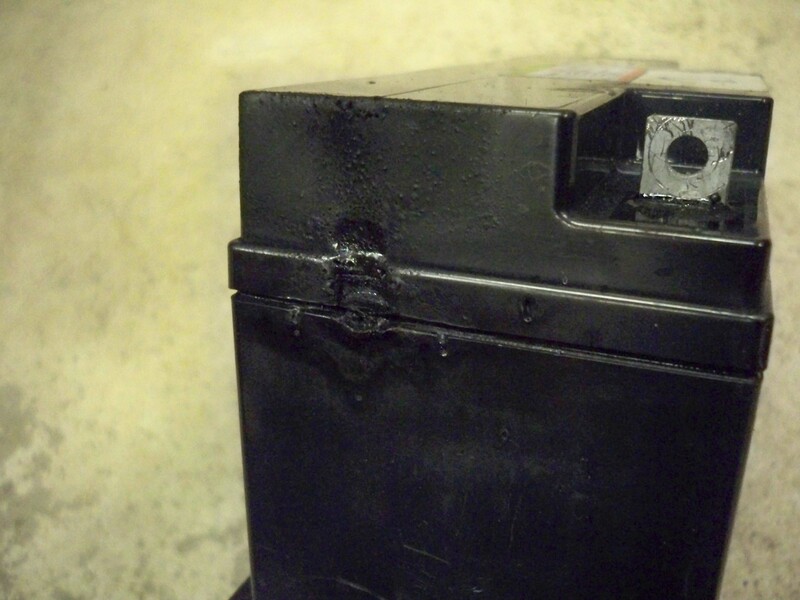 Over the winter my 60 volt Odyssey batteries were killed by a faulty and poor quality charger. 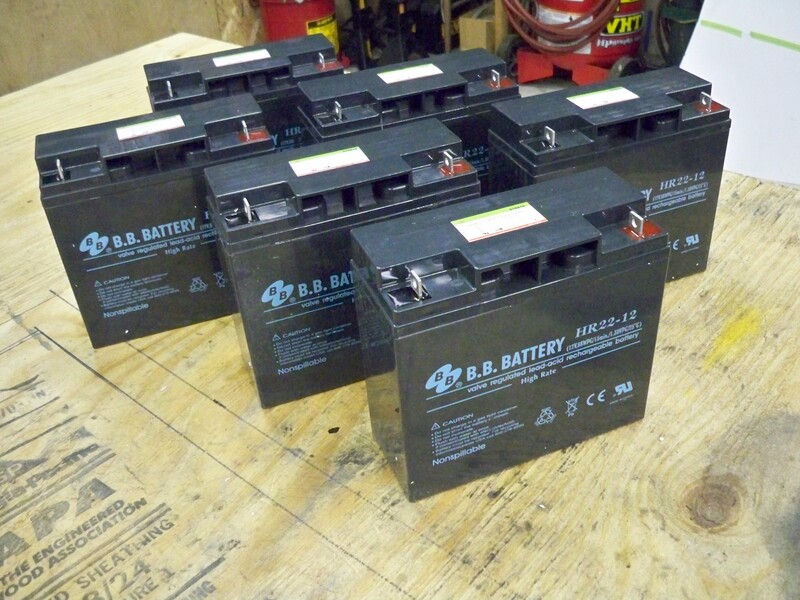 Since I had to purchase new batteries I figured lets upgrade it to 72 volts, I found the same cell size in a B&B cell called the “HR-22-12” they pack 22 amp hours and 72 volts making the pack 1584KW of power. This compared to the previous Odyssey pack of 60 volts and 17 amp hours making a measly 1020KW of power. On top of this I needed to find a reliable and higher quality charger to ensure these cells work properly, and last long. 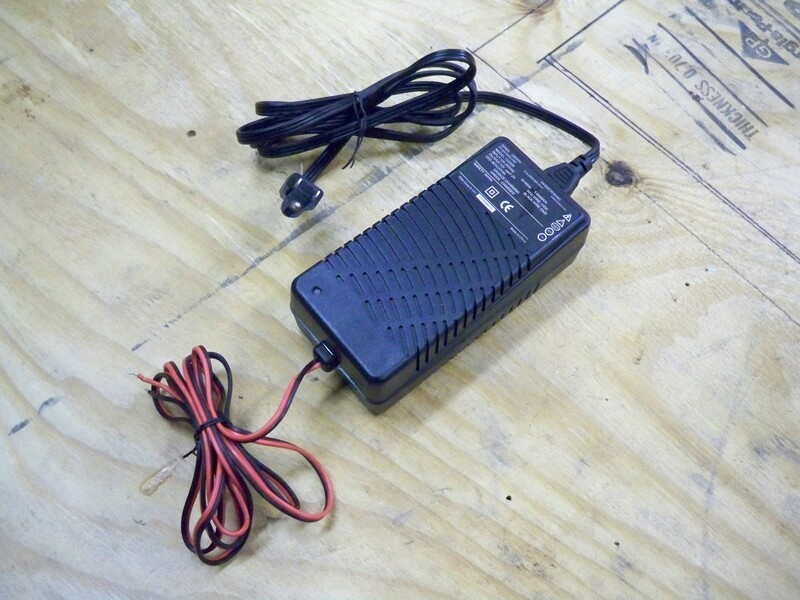 I read many good reviews on the performance and longevity of Soneil chargers. luckily they make one for a 72 volt pack that is small and operates off 110 volt AC input. 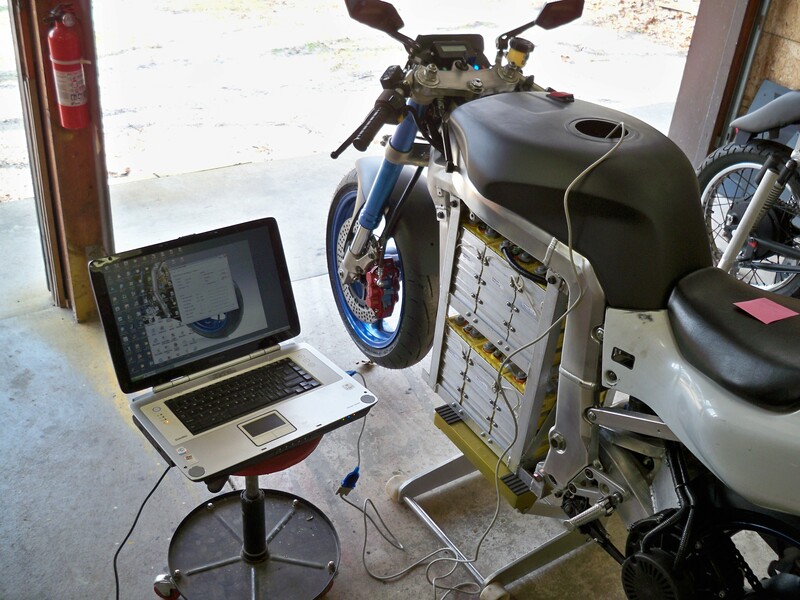 Because of its size and weight I decided to mount it on the motorcycle, now I can charge wherever I park the bike. 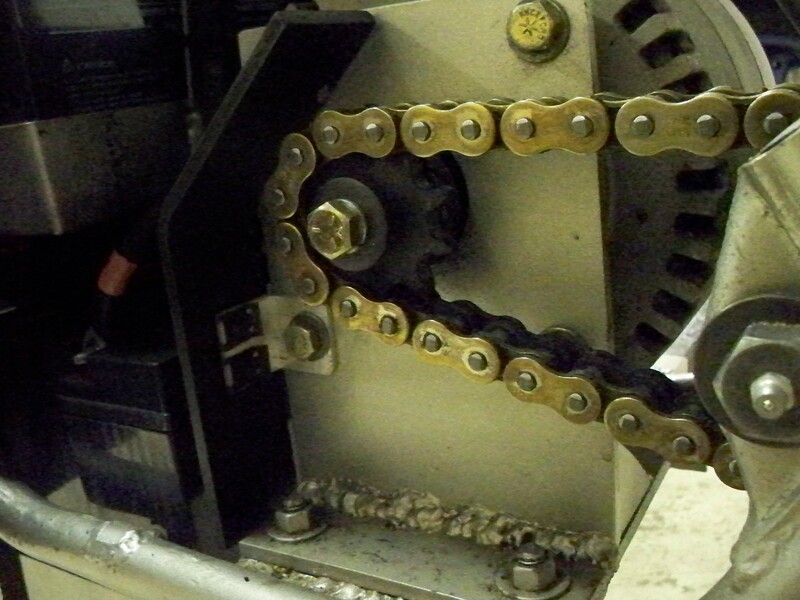 The 50 size “original equipment” chain is over kill and I am currently in the process of machining new drive sprockets in 40 size chain to reduce rotating mass, overall weight, and drive train loss. 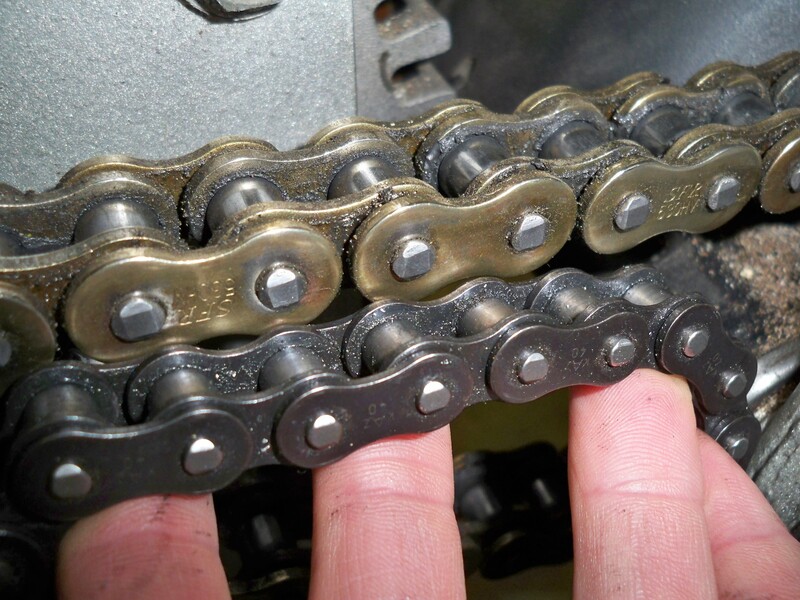 This is the same 40 size chain I am currently using on the E*Speed motorcycle, and I have had no problems with its performance, and have noticed enormous noise reduction compared to the 50 size on the Zion. This modification is not quite finished yet because of delayed parts. larger 50 size compared to the smaller 40 size chain. Hopefully this helps in your decision making on your EV project. Dont waste money, learn from my mistakes! After a bad day with my other motorcycle last week, the weekend was filled with success. As of now I have only rode the E*Speed about 15 miles and I am in the process of making sure everything is working good. So far the motor only gets slightly warm and batteries have stayed very cool, the speed controller has maintained a cool 85 degrees, and this is without the planned vents to help cool it off. I do not have any top speed, range or 0-60 results yet because I plan to finish the body and a few other small items before I can get accurate results. The motorcycle feels great, the video makes it seem much louder then it actually is, my friends say they cannot hear the bike from about 20 feet away. The acceleration is very smooth using the progressive throttle map supplied by Alltrax speed controllers. more video, and specs to come soon. 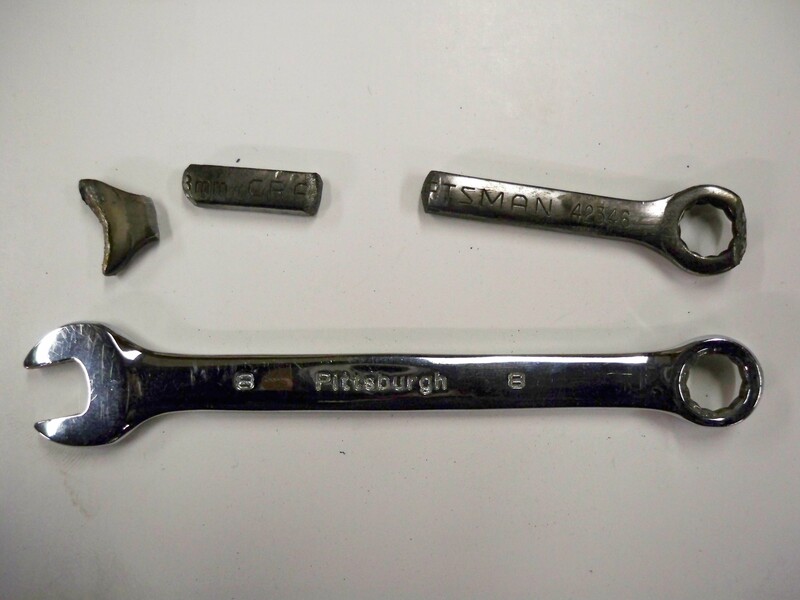 Well I don’t normally update mid-week like this, but while doing some upgrades to the Zion Motorcycle, I had a pretty nasty accident. As I stated in a previous post the charger had failed and killed all my odyssey batteries. Well I was in the process of installing 6 new B&B batteries of the same size as the odyssey’s, this was also upgrading it from 60 volts to 72 volts. Well all the batteries were mounted and I was in the process of some of the final connections when disaster struck. My small 8mm wrench had some in contact with the grounded frame, it only took a split second and the wrench was glowing red, the batteries turned into an Arc welder and flames appeared. It was so bright that I was blinded for a few seconds. l’m only alive right now because I had gloves, and safety glasses on. 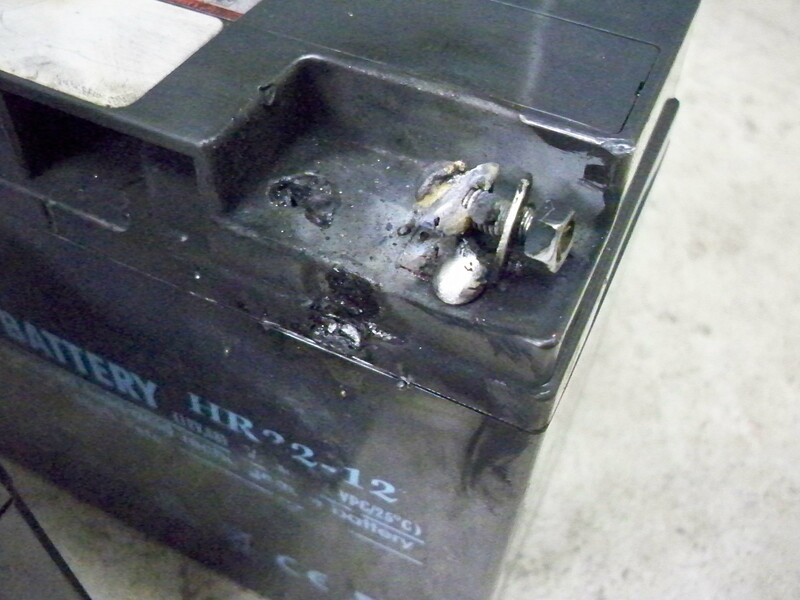 This only proves that an EV builder with years of experience like me can still make mistakes, PLEASE learn from my mistakes and follow all safety precautions, luckily nobody was hurt and only 2 batteries sustained damage. the short only lasted a couple seconds and Im pretty sure the other cells will be allright, they all tested at 13.1 volts after the short. This one may not have looked that bad, but the case is bubbling and it is warped, I cannot trust this cell anymore it could start leaking after a few cycles and cause a fire. I will post up when I have finished all the upgrades for the Zion, after I receive 2 new cells. I will now be dedicating an entire page of the site (on the right side bar) to EV safety, This was a big wake up call to me and I will now be even more careful. I want anyone starting an EV project of their own to be sure to know all the safety issues first, so they don’t get hurt, be careful out there. In previous goals set for the E*speed the original intention was to have a motor-in-wheel, single sided swing arm. This Idea will be ventured in the future, but because of budget and time constraints I had to make the decision to make a simple swing-arm mounted motor. Hopefully for next season the motor in wheel idea will be implemented. For now I have calculated the gear ratio to a 15 tooth front sprocket, and 45 tooth rear sprocket, but from experience calculations can only get you so far. 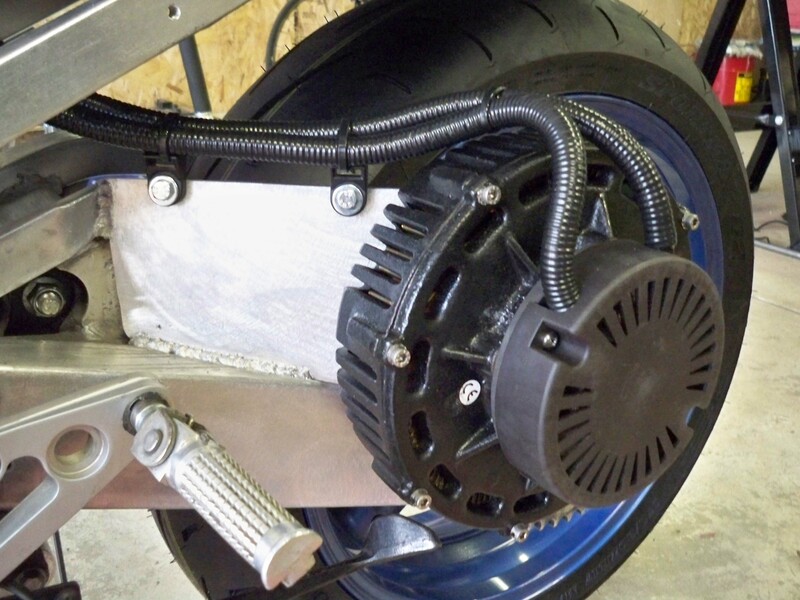 I will be using 40 pitch roller chain to find the perfect gear ratio, and then swapping the drive train to a synchronous belt (timing belt) similar to what Buell uses on there motorcycles. Whenever you start fabricating something on this scale, you should clean the surface of any imperfections that could result in errors. Use a grinding wheel, file, power sander to ensure the surface is flat and true. 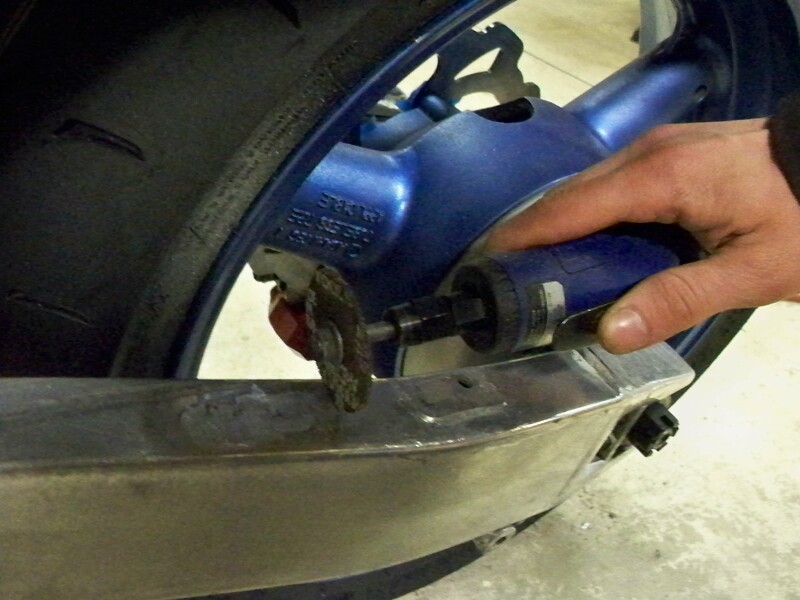 next place the motorcycle in a level place and use a sturdy support (hydraulic jack) to hold the motor in place. 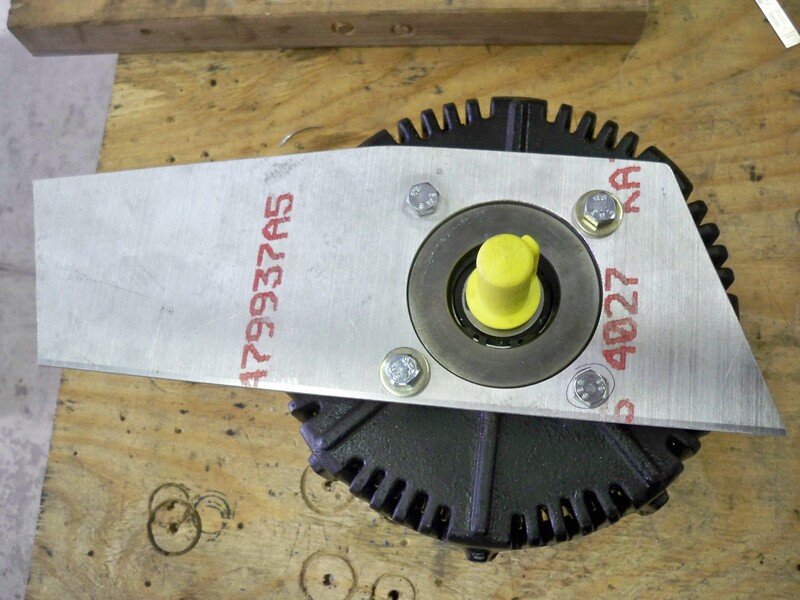 Ensure the motor is exactly where you need it, make sure the sprockets will clear the wheel and arm. I have found that using leveling lasers in this situation helps quite a bit. Once the motor is where you want it ti be, start making a pattern with cardboard. 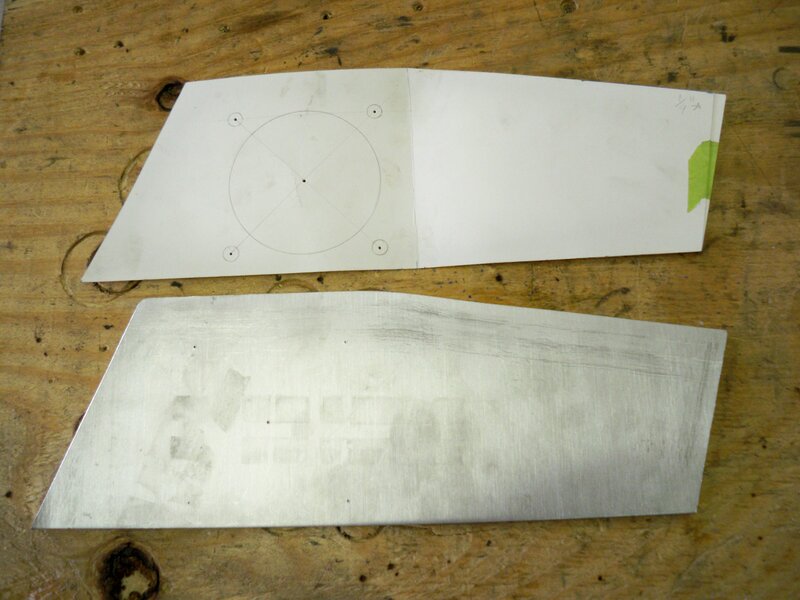 Be very accurate with this as it will be exactly what you will trace and cut out of aluminum. 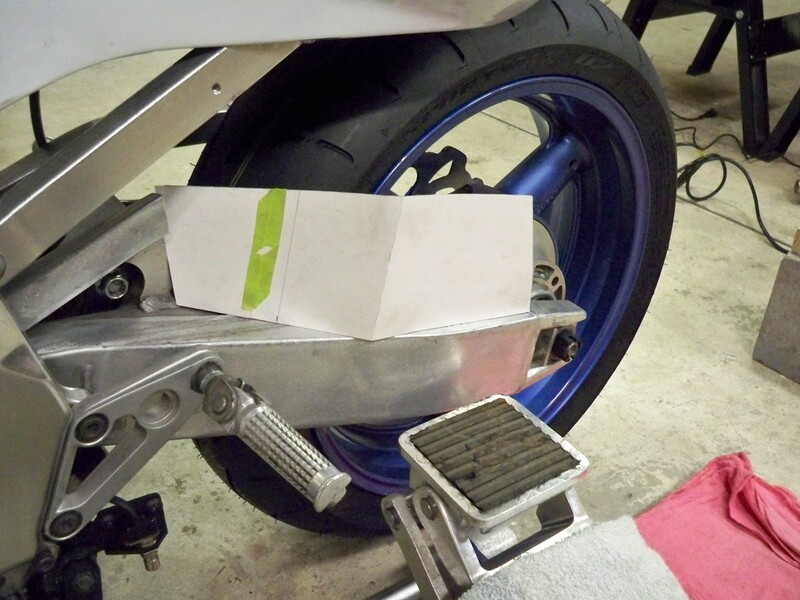 Cut out your pattern, ensure it fits the motor and swing arm. 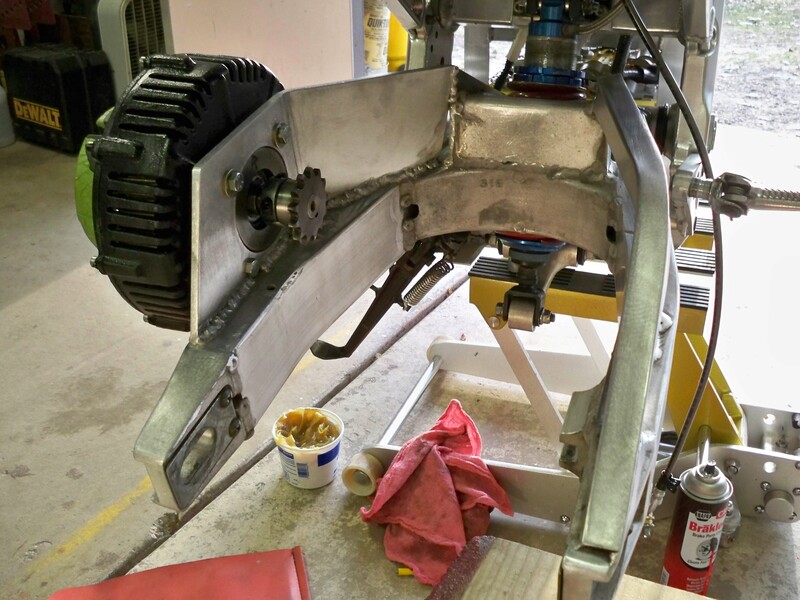 Once the motor bracket is cut out and finished, it needs to be squared to the swing arm and rear axle of the bike. 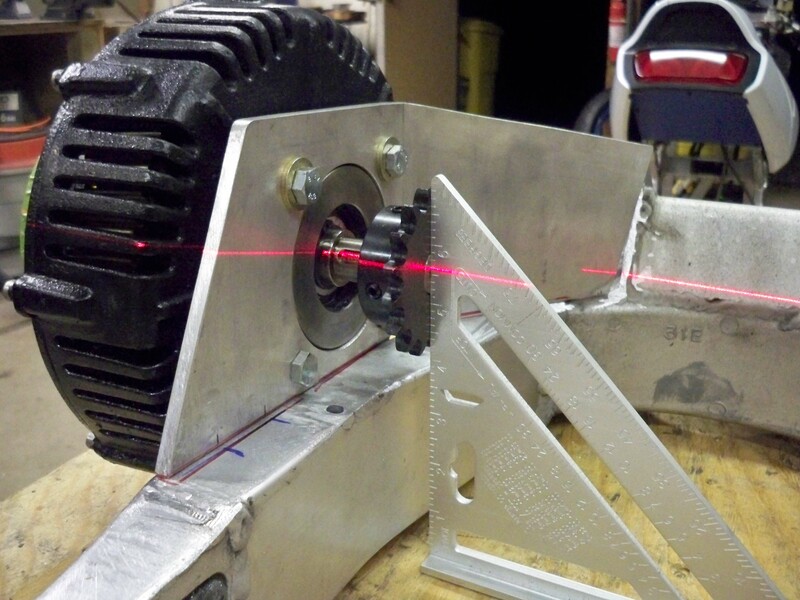 This is accomplished by leveling the swing arm and using aligning lasers with 90 degree squares to line up the motor shaft with the rear axle. When the motor bracket is in the position where it aligns with everything else then tack weld 3 spots to hold it on. Re-level the swing arm and motor and ensure that everything is still where it should be, Then finish weld the motor bracket. Once all this is completed mount the swing arm back on the motorcycle, attach the motor and wheel. Once everything is re-attached start running power wire from the motor to the speed controller, be sure to leave plenty of slack in the wires where the arm hinges. 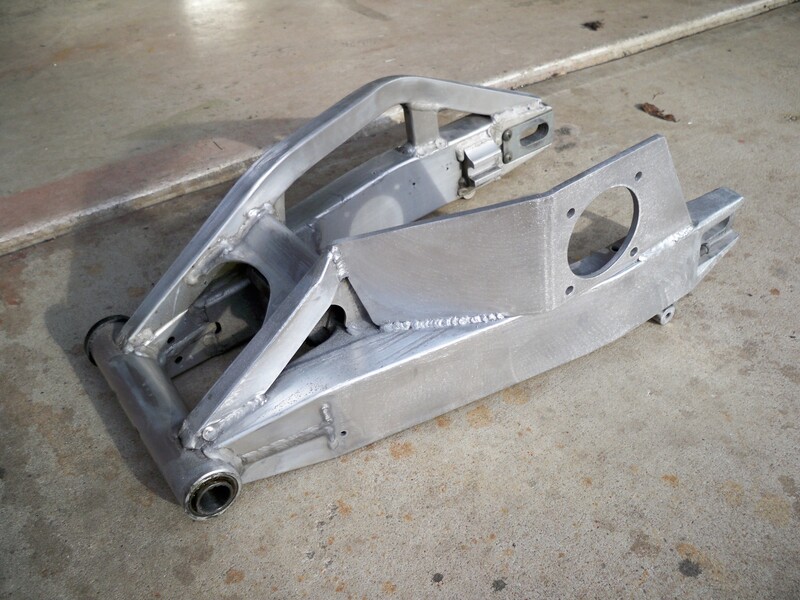 The swing arm will be moving up and down quite a bit and could result in a wire rubbing through and shorting. The wires should be covered in loom and taped to ensure no chafing could occur. 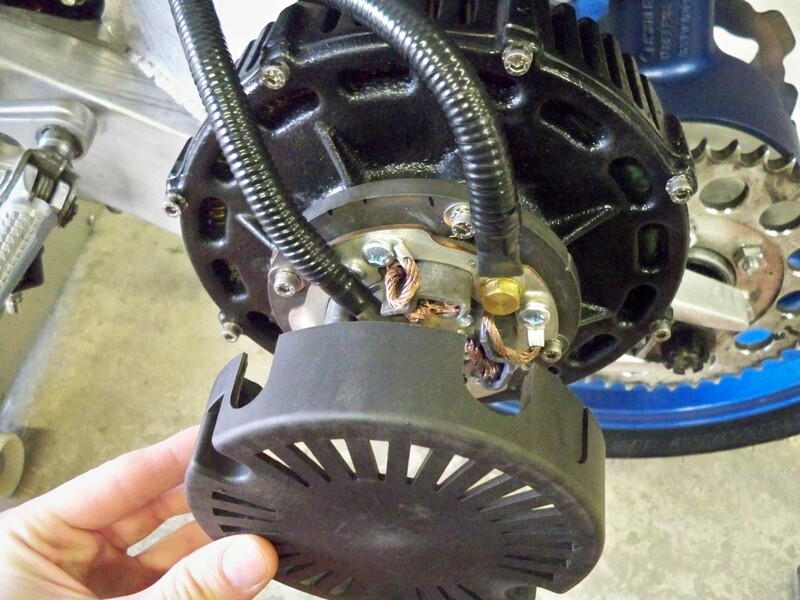 Trim the motor cover very close to the wires, this is a place where you do not want dirt or water to build up in. 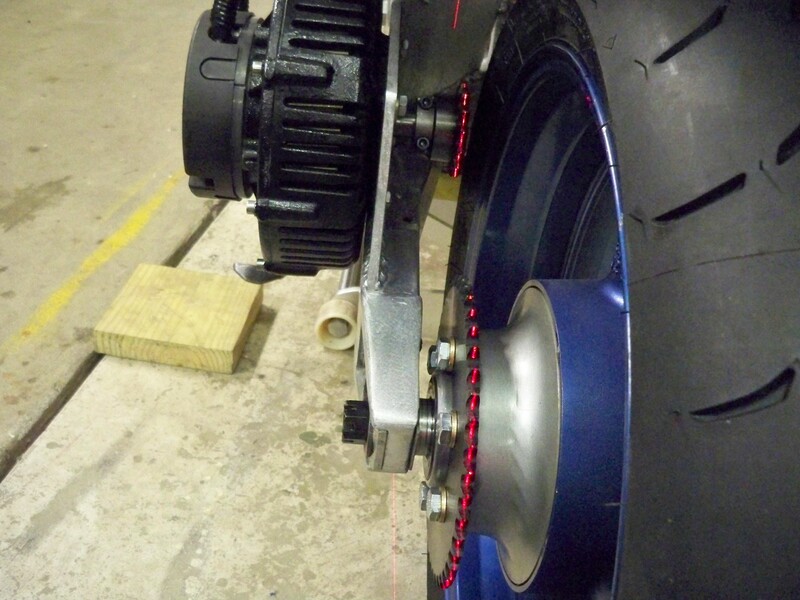 When you are all done, attach everything on or around the swing arm. 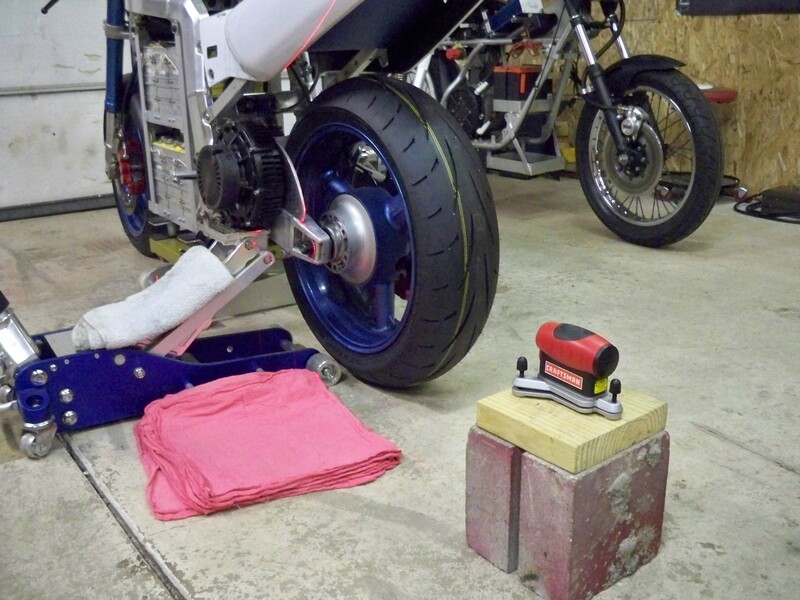 Lower the motorcycle on the ground sit on it, bounce up and down and ensure that nothing is rubbing, bending or chafing, if it is then it must be re-engineered. Once it is all done it should look professional and well built, remember this is a motorcycle and your life depends on your workmanship. I just sent the sprockets out for some minor modifications at the machine shop. When they arrive I will update with sprocket information.